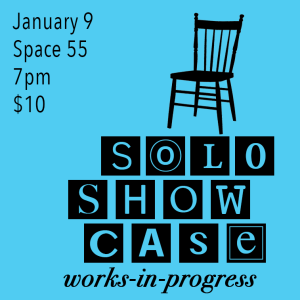 The Solo Showcase is an evening of excerpts of Works-in-Development. Six solo-performers, poets, storytellers and spoken-word speakers present brand-new, never before seen, solo performance pieces developed in the Solo Workshop at Space 55. With Scott Davidson, Rodney Dickerman, Kevin Patterson, Dilcia Yanez, Joy Young and Poet Terry.